Henrietta Simpson: You must get to know a lot of people's little secrets. Kelly Towne: I try not to. I'm a nurse, not a priest. You know that feeling when you sit down to watch a movie and the lead character looks really familiar, but you can't place where you've seen them before? I had that experience with this production from the land of the kiwi, The Last Tattoo, and its star, Kerry Fox, who I was sure I was mistaking for someone else (I often do that), though I couldn't recall who or from where. All I could recall was a rather frumpy young girl in an orange knit sweater, who looks little like the woman in this film�but my vindication came when I discovered this is none other than the girl who had played Janet Frame, a writer who is locked up for eight years as a schizophrenic and subjected to shock therapy in Jane Campion's 1980 An Angel at My Table. She would later star in Shallow Grave�after seeing this film I wonder why we don't see her in more productions, as she has been excellent in those I've seen. Outside the works of director Peter Jackson (Bad Taste, Heavenly Creatures, Lord of the Rings) or the above mentioned An Angel at My Table, I could probably list the films I've seen produced by New Zealanders on one hand. Here, director John Reid (Middle Age Spread, Carry Me Back) teams up with writer Kevin Aberdein for their third picture together. We are in New Zealand during World War II. While the home boys are off fighting in the war, allied servicemen invade the island as the US plans its next moves against Japan in the Pacific. Despite the memos from the American command, a lot of transient relationships spring up between the Americans and New Zealand's women, either in the brothels or with those whose men are away from home. When an American serviceman is murdered in front of his fiancée (Katie Wolf)—an ex- prostitute—outside a tattoo parlour, Captain Michael Starwood is assigned to the case. In the course of his investigation he runs into Kelly Towne (Fox), a worker for the health department who deals with one of the side effects of the American invasion, the venereal diseases passed amongst the visitors and their native partners. Her inroads into the brothels of the city by having gained the trust of the prostitutes is seen by Starwood as a way to locate the witness, who has gone missing. Towne wants no part of the investigation, but she also has to follow up reports from the American soldiers who report on their partners, and the missing girl is pivotal in tracking down a new and uncurable strain of VD. As a web of mystery and deceit begins unravelling into the upper echelons of the military and government, locating the girl may be her only hope of getting to the bottom of the mystery, if she doesn't wind up as a victim herself. The Last Tattoo was surprisingly pretty good; the suspense and plot development was decent (despite a few events I'd deem a bit too coincidental for reality) and the acting above average. Despite not being pictured on the cover, the film belongs to Kerry Fox, who delivers an outstanding performance, without some of the forced emotional swings present from her costars. Tony Goldwyn (Ghost) has a habit of pushing the wrong buttons for me at times in all the films I've seen him in, and this is no exception, though I blame the director's hand in this. Rod Steiger (General Frank Zane) and Robert Loggia (as a pretty typecast Commander Conrad Dart) turn in acceptable performances, though neither is really challenged by their roles. There were a few scenes where "acting" set in, moments when you can feel the director guiding the shot, but most of the time things seemed pretty natural. I wouldn't put this on my A list of films to recommend, but it holds up pretty well, has an interesting premise, and kept my attention throughout. The complexities of real world human interaction play a big part in the film, and it is refreshing to see real life issues approached in this fashion. Image Transfer Review: Anchor Bay does it again with another fine looking anamorphic transfer. There is very little to complain about here. Colors are strong, black levels fine and the image looks nicely detailed if only a bit soft. No signs of edge enhancement. There may be a few places that seem overly dark, but nothing that will ruin the presentation. Audio Transfer Review: The mono track is presented well, with good definition and clear dialogue. Frequency range is well covered, with no signs of hiss or distortion. A very natural sounding track. Extras Review: The film's theatrical trailer is available in anamorphic widescreen. The insert card duplicates the cover on heavy cardboard, backed by the chapter listings. The cover is deceptive, making this New Zealand produced title look like a war story, when in fact it is a nicely complex and intriguing interesting suspense film which uses some unusual thematic elements to pull it all together. 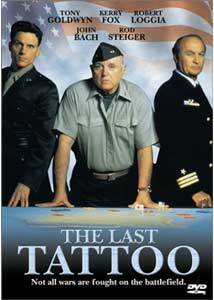 While the script has a few weak moments, and some of the scenes are over directed, The Last Tattoo was a pleasant surprise, especially Kerry Fox's performance. Anchor Bay delivers another nice presentation. Recommended for at least a rental.